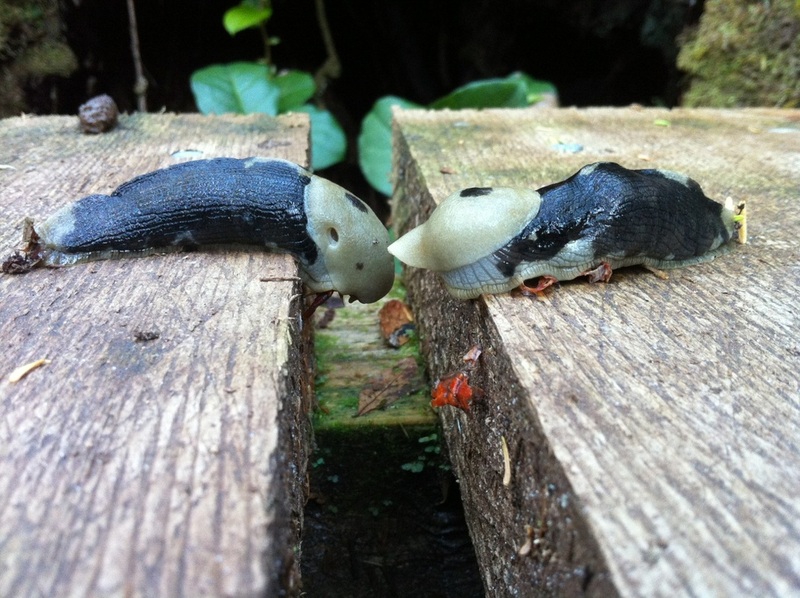 Top: two banana slugs meet along a boardwalk. Photo by Sara Wickham. Left: a heavily spotted slug. The lighter coloured area is the mantle, which in this case bears a dark spot. Photo by Alanah Nasadyk. Middle: unspotted slug. The top segment behind the tentacles is the mantle, while the 'body' portion behind and beneath is the foot. Photo by Heather Polowyk. Right: an unspotted slug photographed by Kelly Fretwell. True to their name, banana slugs are large somewhat banana-shaped slugs - though they are not necessarily yellow. They are the second largest slug in the world, and can get up to 25 cm long. 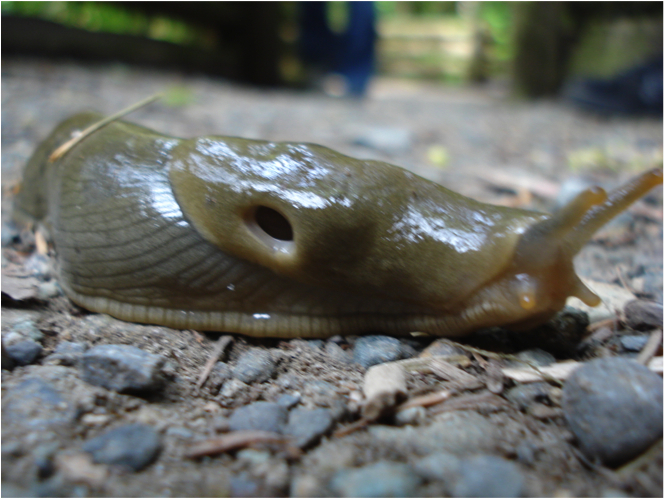 The common name of 'banana slug' implies that these slugs are yellow, but their colouring can be quite variable. Generally they all have a light mantle (the top portion right behind the antennae), which ranges in colour from a creamy white to an olive green and sometimes has a central dark spot (as in the top right photo). 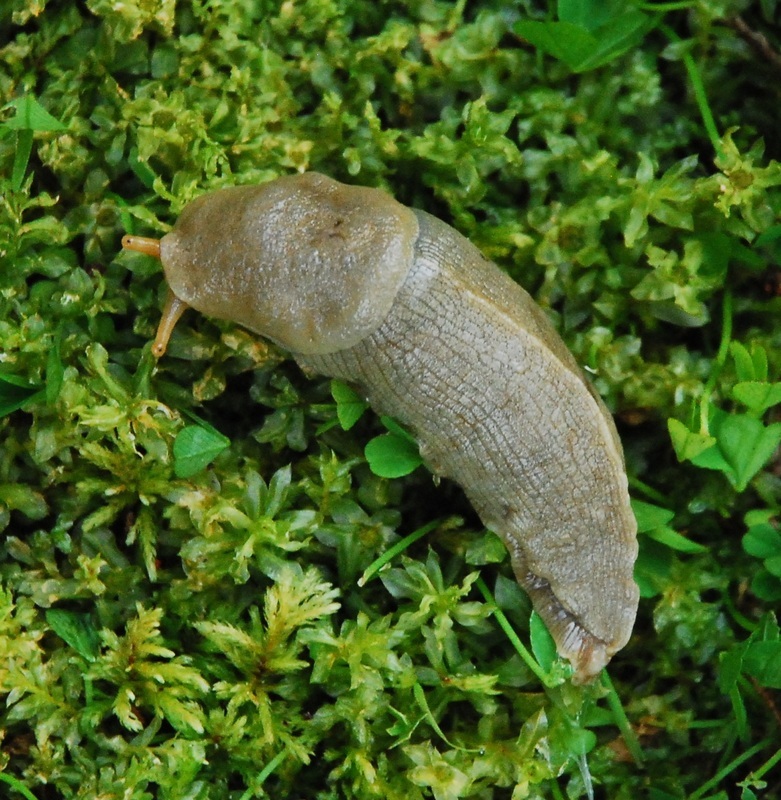 The 'body' of the slug (the foot) is a similar colour with varying amounts of dark brown or black spots. Some slugs have no spotting, and some are so spotted that the body appears to be solid dark brown or black. Generally the heavily spotted slugs have mantle spots and darker background body colours, while the lighter- or un-spotted slugs have lighter body backgrounds. 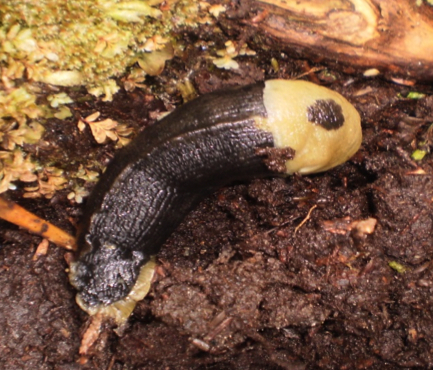 Pacific banana slugs live in moist forests from Alaska to central California, and are often found in dark, damp areas such as under logs or other decomposing . They are most heavily concentrated in California. The common name of banana slug applies to five species in total, of which the Pacific banana slug is the widest-ranging. Ariolimax stramineus ranges south of central California into Mexico, while A. californicus, A. brachyphallus, and A. dolichophallus have small ranges on the San Francisco peninsula. The banana slug is the official mascot of the University of California Santa Cruz; the role of 'Sammy the Slug' at UC Santa Cruz was threatened by a proposed change to a sea lion mascot, but the beloved banana slug won out in the end. Banana slugs are omnivores - they eat plant matter, such as fruits, berries, low-lying leafy plants and deciduous shrubs, as well as feces and carrion. They play a role in forest decomposition as well as seed and spore dispersal. They are preyed upon by the northwestern salamander (Ambystoma gracile), which can successfully feed on banana slugs their own size. Attacks from birds are thwarted by the slugs' mucous covering and a mucous gland that goes into production when the animal is disturbed. Studies of Pacific banana slugs on islands have shown a correlation between slug spotting and island size and vegetation cover. Smaller islands and those with less vegetation cover tend to have slugs with less spotting and more homogenous colouring. Larger islands, and those with more cover, tend to have slugs with more spotting as well as more variation in spotting. Colouration may also vary with diet and moisture level. Cody, M.L. (2006). Plants on Islands: Diversity and Dynamics on a Continental Archipelago. Berkeley, CA: University of California Press. Pp. 195-204. Forsyth, R.G. (2004). Land Snails of British Columbia. Victoria, BC: Royal BC Museum. Pp. 122-125. Thomas, K. (2000). Ariolimax columbianus. Animal Diversity Web. University of Michigan Museum of Zoology. Accessed 05/02/2014.